The cover of the medium portfolio is embellished with the large Year sticker mounted on three layers of coordinating papers….patterned and cardstock. Stamp numbers (2010) onto punched circles and mount those on a coordinating paper background. The circles are mounted on a strip of patterned paper layered with a narrower strip of cardstock. Put a brad through the eye-hole of the bird and attach. Tie coordinating seam binding ribbons to the elastics that hold the portfolio together. The clock face and a Princesca charm are both attached with the jump ring to the waxed linen on the outside of the portfolio. 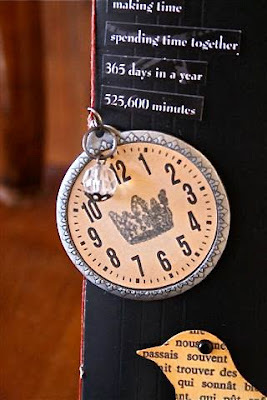 I stamped a small crown onto the face of the clock. Additional sticker strips were used on the cover. To make the signature, cut three sheets of Barcelona paper to 12”x 9”. Fold each sheet in half with the 9” being the height of the pages. Stitch to portfolio using waxed linen. Cover the inside front and back covers with Barcelona papers to fit. The flaps are also covered, but separately from the inside and outside covers for ease in folding. On the top flap, I listed anniversaries during the year. On the long side flap I listed birthdays I want to remember. Each page is embellished with stickers from the two sticker sheets. I tied a ribbon through a small hole I punched in the back cover at the top. It’s cut longer than the length of the portfolio. Allow enough ribbon to tie through the hole at the top and also through a Princesca charm at the bottom to mark your place in the calendar. I stamped the blank calendar clear stamp on 4”x 5 ¼” pieces of Marco paper (the side with the writing). I then added the dates for each month, along with dates I want to remember each month. Note: I stamped a tiny ampersand on the birthday dates and a tiny heart on the anniversary dates to remind me to look at the master list I had created on the flaps. 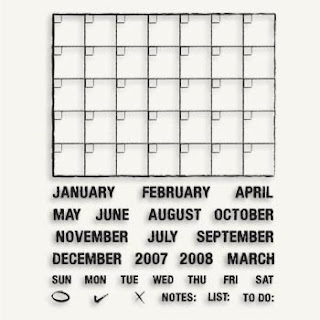 The edges of the calendar were inked and it was mounted on a piece of ivory cardstock for stability and those edges were also inked to coordinate with the page. Stamp the month on either a lighter colored Barcelona paper or a piece of ivory cardstock that’s been background stamped with antique linen distress ink and a script stamp. Mount on cardstock and again on a coordinating Barcelona paper. 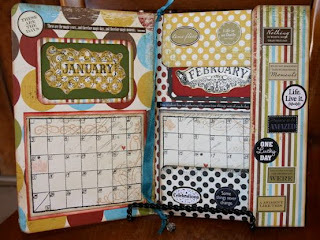 Ink edges of each layer and adhere to calendar. The centerfold of the calendar doesn’t include a month. It’s a blank space for photos of your choice. 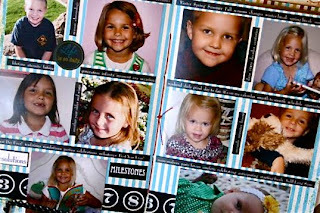 I included pictures of my grandchildren. Now I am ready for the new year! The PERFECT gypsy project! Love the colors and goodies you used! WOW!!! This is amazingly awesome!! love what u did here..Great idea!!! 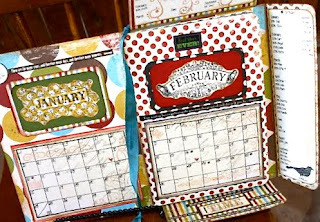 What a great calendar project -love it! 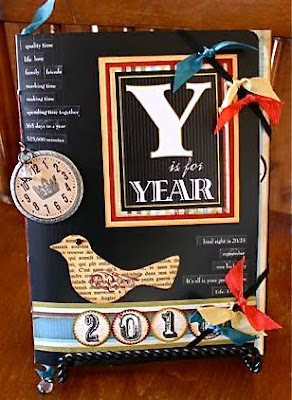 I love, love this calendar, this is something I definitely want to make! ann, can we have you come to our store and teach this portfolio? OMG!!!!!!!!!!! out of this world!! ann the number to contact me is 208-280-2073! !